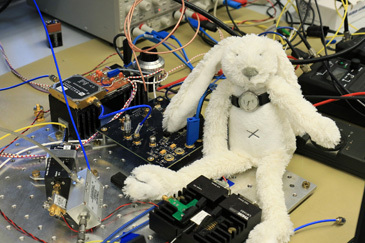 Attendees gained hands-on experience with the calibration devices and other instruments required for White Rabbit calibrations. It was discussed how calibration devices and setups could be replicated by the other WRITE partners in their home laboratories. The documentation of calibration techniques (WP1 deliverable) was started. WRITE participants from VTT, INRiM, NPL, 7Sols and OPNT attended the bootcamp. 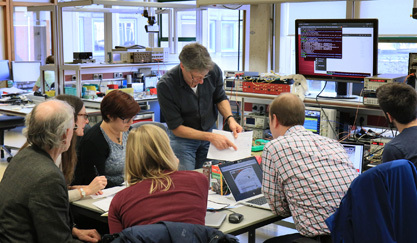 A hands-on ‘calibration bootcamp’ took place at Nikhef in Amsterdam on 12–16 November 2018. 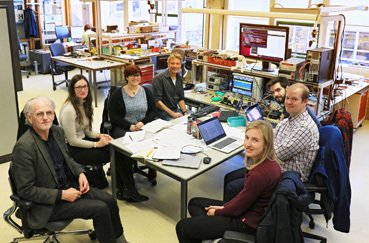 The motivation was to transfer knowledge that Nikhef has on absolute calibration and delay-propagation calibration to other (mainly WP1) WRITE partners. The 10th WR workshop was held at CERN, Geneva (Switzerland) on 6–7 October 2018. Topics included WR technology evolution, applications and the process of standardisation under IEEE 1588.